This week, Burger King found itself in hot oil with a few influencers after 'exploiting' them to promote a product. One influencer to call the company out was YouTube vlogger Casey Neistat. In a video, Neistat explained how the fast food joint had been liking old tweets in order to spark influencers to post about the brand. He then expressed his disdain for the move, calling it manipulative. However, Neistat offered Burger King a chance to redeem itself after the move. At the end of the video, he references a couple of charity organisations and urges the chain to get in touch with him about working with them. But how much does Burger King actually owe Neistat? Analytics company Zoomph has worked it out. 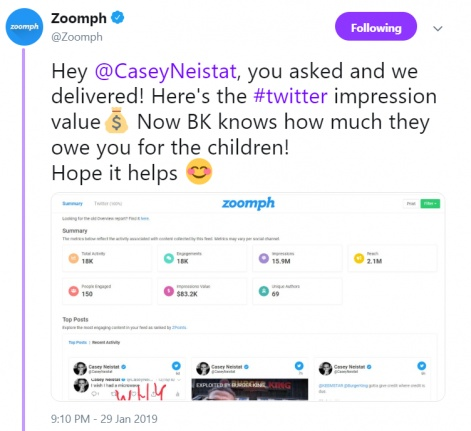 Using data from multiple sources and 'patented' algorithms, Zoomph worked out that Neistat's social engagement was worth $83.2k. His one post on Twitter generated 15.9 million impressions, and had a reach of 2.1 million. It also had over 18k engagements. 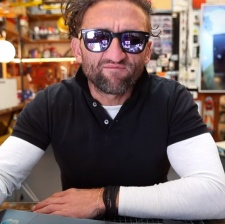 The company posted its finding to Twitter, captioned: "Hey @CaseyNeistat, you asked and we delivered! Here's the #twitter impression value. Now BK knows how much they owe you for the children!" Now Burger Kings knows that it extracted at least $83k's worth of promotion from the YouTube star, we'll await their next move, which is hopefully a sizeable donation to charity.